I’m Thomas Baumgardner. Welcome to my site! Hi, I’m Thomas (or Tom, to some people). I’m an artist interested in many different fields, currently residing in New Orleans, Louisiana. Please look around this site, especially at the images above, which link to pages about my most recent film projects. Guinevere was my pre-thesis project at The University of New Orleans. The film was a 13-minute short about a magician’s assistant (Claire Frederiksen) who discovers that her employer Nikolay’s (Samuel Cobean) death-defying tricks are actually not tricks at all. The film also stars James Yeargain as a mysterious stranger who seems, for some reason, to be on Nikolay’s trail. Gwen (Claire Frediksen) ties a blindfold around Nikolay (Samuel Cobean) as part of their magic act. The film was ambitious. Basically a thriller with magical elements, there were both complicated stunts and a fairly robust world we had to create visually. Nikolay is a man who has traveled all over the world and his backstage home had to be filled with all sorts of oddities. We also had to “hang” Sam, our Nikolay, as part of Nikolay’s death-defying performance. He hangs himself from a gallows and then is cut down by his assistant, only to stand up unharmed. Alexander Lanaux oversaw the construction of the gallows, which had to not only look right but also function. It needed to be able to support Sam’s weight and more. When it was finally completed and tested, Alex was confident it could bear over to two times Sam’s weight and it functioned flawlessly during production. 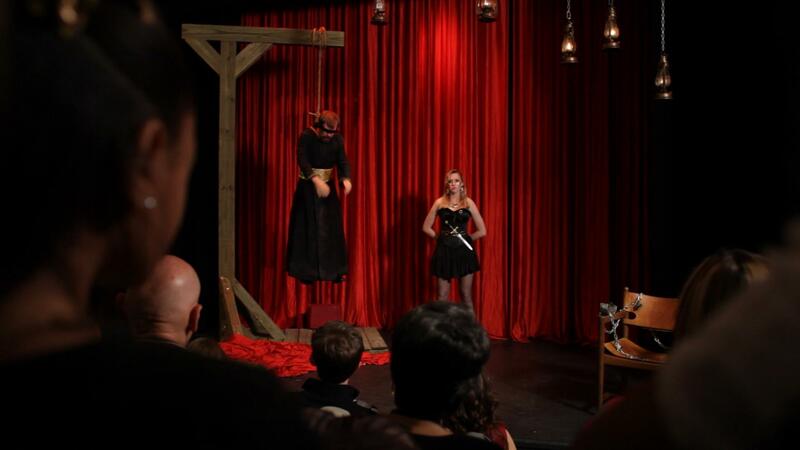 Nikolay (Sam Cobean) hangs from the gallows as Gwen (Claire Frederiksen) lets the audience take it all in before cutting him down. To achieve this effect we had Sam rigged in a hanging harness, the same as used for similar stunts in Hollywood, which was worn under Sam’s robe. A strong cable was placed inside the rope noose and then hooked to a loop in the harness behind Sam’s head. In this way, the noose around Sam’s neck was never actually attached to anything (it was held in place by a piece of tape) so if the cable were to break it would be impossible for the noose to hold and Sam could not be in any danger. 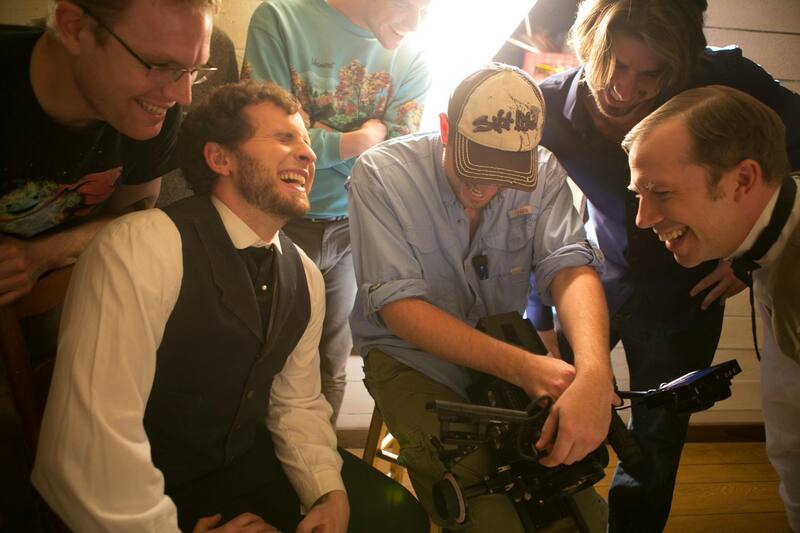 Myself directing Sam Cobean, who portrays Nikolay, the magician. Margaret Broach was the Production Designer on the film and did a great job assembling an army of strange props to adorn Nikolay’s prop table backstage. Marcus Pontello sewed Nikolay’s robe. The initial pattern for the robe was for a Matrix-type coat, the sort of cassock-type piece that Keanu Reeves wears at some point in that series. Marcus took that pattern and altered it into the item that we used for Nikolay, adding the gold touches himself. I had always wanted a color scheme of black and gold to represent the presence of both magic and death in this world. Obviously, Nikolay’s act revolves around death but there are other mortal threats in the story beyond Nikolay’s faked demise. 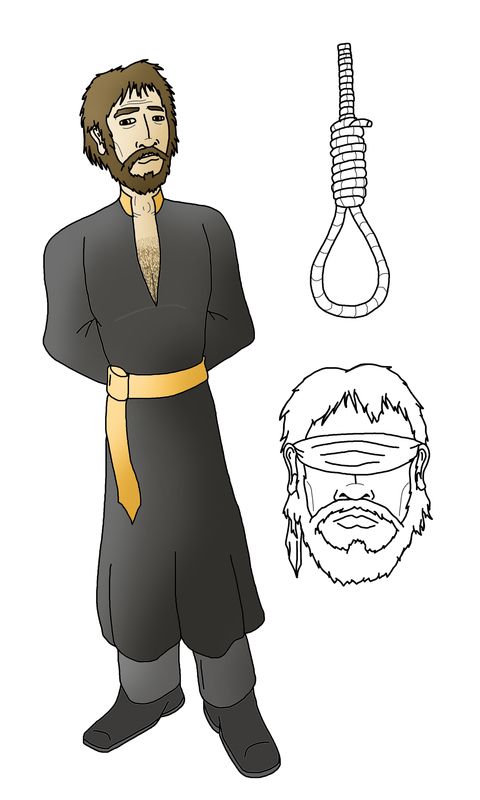 A design sketch I did of Nikolay, during pre-production. Ultimately, Guinevere is a fun story that I think has a unique premise and explores adventurous territory not often explored in short films. Shape Matters is a 19-minute short created as my thesis project at The University of New Orleans. It’s a period comedy, set in 1853, that takes place in the Southern United States. The story concerns a neurotic preacher, William Wheeler, who becomes wrapped up in a local murder and the skull-studying pseudo-science of Phrenology after he meets an eccentric girl, Catherine, at the wake of the murdered man. William (Jacob Hoyson) is confronted by Catherine (Anna Brown) after he leaves the wake for her uncle. I was director, writer, and editor for this project. I utilized a crew of about 20 and a cast of 5 principal actors and a number of extras. The film was a challenge to create but also a wonderful opportunity for me to explore all areas of production and a chance for me to collaborate with some truly talented local artists. 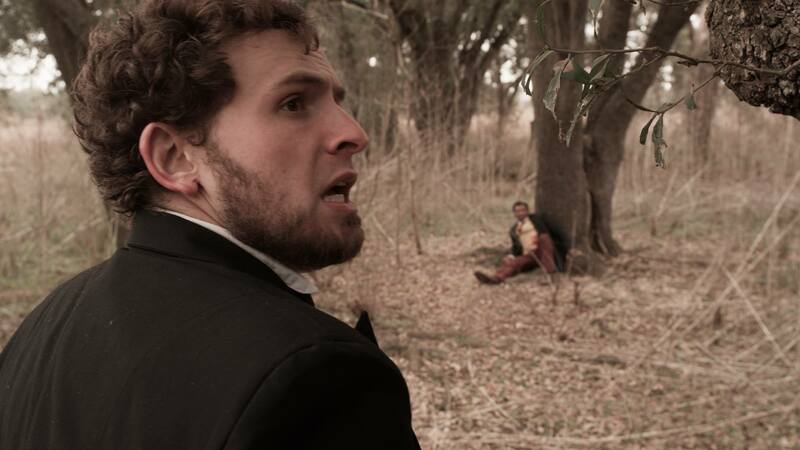 We shot at a number of beautiful historic Louisiana locations and had to assemble period accurate props and costumes. We even had to build our own “Phrenological Society” on the UNO soundstage; it ended up seamlessly blending with the actual historic locations. The film was produced by Elijah Eastlund and Jordan McVey who were both instrumental in securing the locations needed for the production, among many other responsibilities. 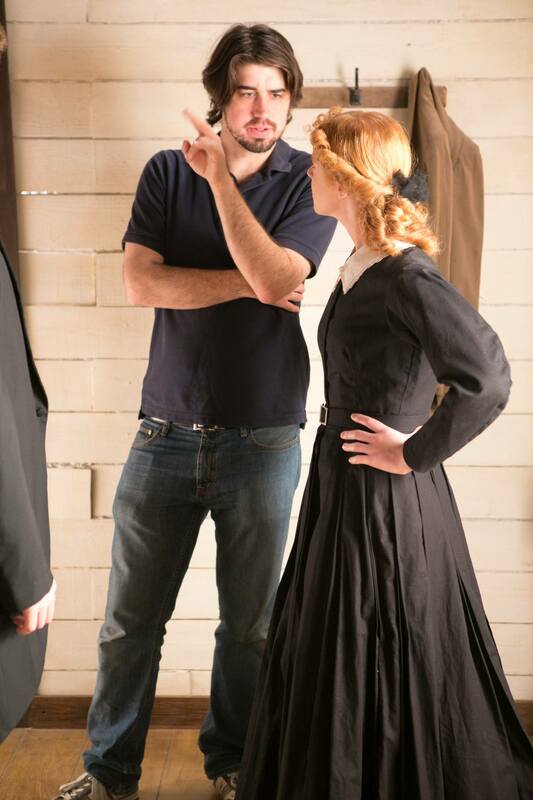 Myself directing Anna Brown as Catherine. My goal was always to create a film that existed comfortably in the 19th century and yet had a contemporary energy. I didn’t want to make a stuffy parlor room movie; this shouldn’t be Masterpiece Theater. I think we achieved the right balance of comedy and drama and had enough idiosyncracies to the characters that the film does not feel limited in anyway by its setting. The cast includes: Jacob Hoyson as William, Anna Brown as Catherine, Tim Bellow as Cyrus, Sam Cobean as Prentiss, and Casey Groves as Clark. The Director of Photography was Trenton Mynatt. We decided to go with a handheld style, to compliment that contemporary energy I talked about earlier, and to save time during production. For the final look of the film we went with a desaturated, yellowish-tint to try and capture the look of an old photograph. It lends the movie a certain old fashioned flavor. Trenton’s demo reel can be viewed here. Ellen Bull was the Production Designer. Alexander Lanaux oversaw the construction of the our soundstage set with Ellen. She dressed that set, distressed it, and did so for all our other locations. You can get a sense of her work in the various screenshots here and view her other projects at http://ellenbull.com/. 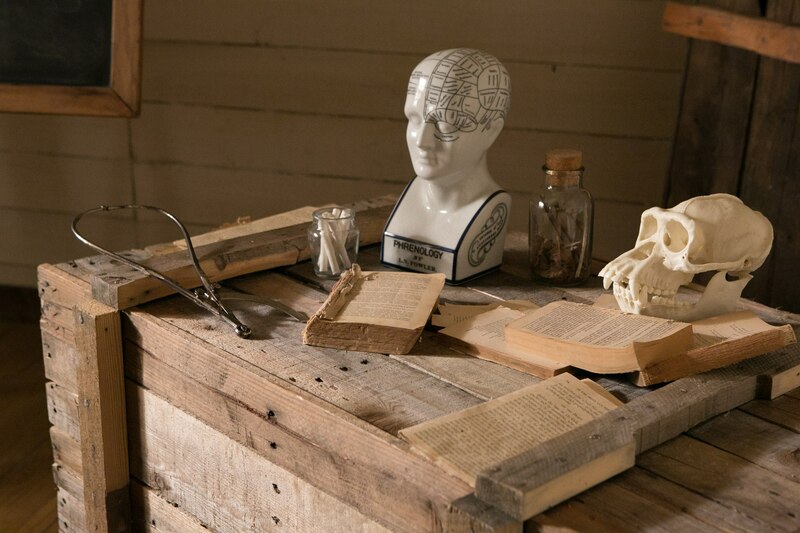 A corner of the Phrenological Society set that we built on the UNO soundstage. Costumes were by Barbara Vinson. She purchased costumes from a variety of sources including many businesses that supply historic homes and plantations. An important part of the production was to give the sense that the world was “lived in”. This was particularly crucialin terms of costume and so we worked to make sure that the clothes our characters wore appeared to have been well used; after all, none of our characters were wealthy and would probably only own a few outfits, all of which would have been worn and washed many times over many years. 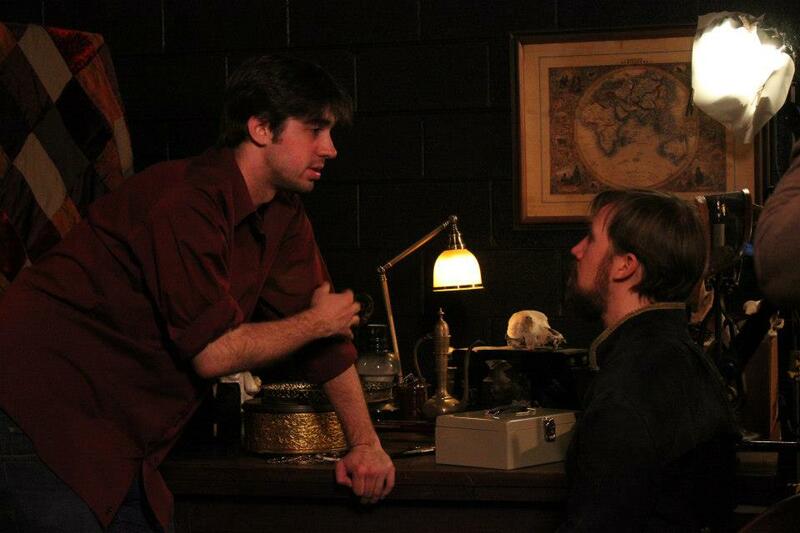 William (Jacob Hoyson) discovers Cyrus (Tim Bellow), much to his dismay. Maria Hinterkoerner assisted Barbara with costumes, including the process of properly distressing them to give them the necessary “character”. Crystal Wells did Hair on the film, with Stephanie Jennings assisting her. 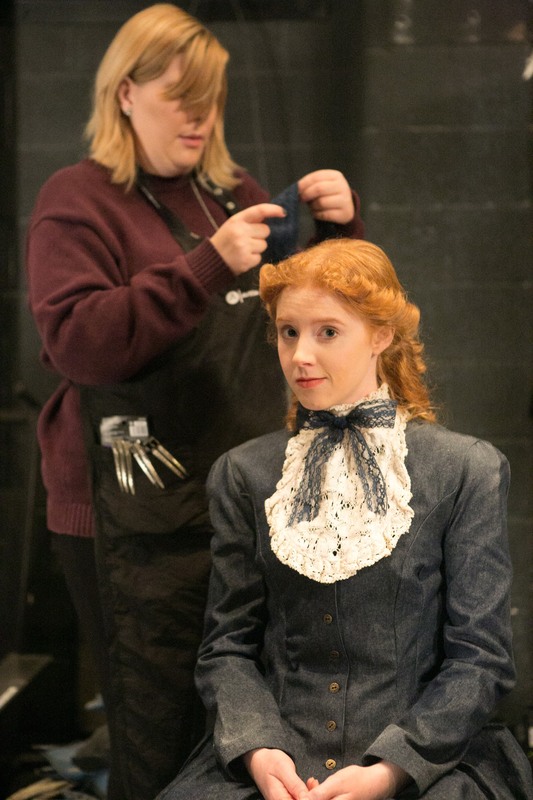 Stephanie finishes Anna Brown’s hair. I can’t imagine a more essential component of doing a period piece than hair and you can tell from the photos that Crystal and Stephanie really transformed our actors in an amazing way.Once they were in Barbara’s costumes and in their period hair they really did look like they’d stepped out of a time machine. Shape Matters was a challenge to make but a joy to work on. I think it effectively represents my growth as an artist and incorporates the many things I’ve absorbed since I arrived in New Orleans. Apparently it was fun making this film.